Terrell Raymonn Suggs (born October 11, 1982), nicknamed T-Sizzle or Sizzle, is an American football outside linebacker for the Baltimore Ravens of the National Football League (NFL). He played college football at Arizona State, and was recognized as a unanimous All-American. The Ravens selected him with the tenth overall pick in the 2003 NFL Draft, and he is now the team's all-time leader in sacks. Suggs is a six-time Pro Bowl selection, a two time All-Pro and was the NFL Defensive Player of the Year in 2011. Suggs was born in Minneapolis, Minnesota, the son of Laverne Diane (née Kennedy) and Donald Lee Suggs. He was raised in St. Paul, Minnesota. While growing up in Saint Paul, he played youth football, as a center, with future baseball player Joe Mauer. Suggs moved to Arizona after eighth grade As a teenager, he attended multiple schools, the first being Chandler High School. He later transferred to Hamilton High School where he set the Arizona Class 5A record for rushing yards in a game with 367 against Yuma Kofa as a junior in 1999. In addition, Suggs lettered three times in basketball and once in track and field. Suggs was drafted by the Baltimore Ravens 10th overall in the 2003 NFL Draft, becoming one of the youngest defensive players ever drafted at only 20 years old until defensive tackle Amobi Okoye was drafted by the Houston Texans at the age of 19 in 2007. Suggs enjoyed immediate success as a rookie in 2003 as he tied an NFL record by posting a sack in each of his first four games. He finished the season with 27 tackles (19 solo), 12 sacks (a Ravens franchise rookie record), 6 forced fumbles, 2 pass deflections and 1 interception, earning him Defensive Rookie of the Year honors while only starting one game that year. The next season in 2004, he was elected to his first Pro Bowl as he recorded 10.5 sacks and 60 tackles (45 solo). In 2005, the Ravens' new defensive co-ordinator Rex Ryan, son of famous defensive coordinator Buddy Ryan, moved Suggs from outside linebacker to defensive end in many of the defensive schemes. Despite registering a then-career-low 8 sacks, Suggs also set new career-highs in tackles with 69 (46 solo) and interceptions with 2. In 2006, Suggs was part of the NFL's best overall defense, the unit allowing a league-low 12.6 points per game. He recorded 64 tackles (46 solo), 9.5 sacks and set new career-high in pass deflections with 8. After the season, he was voted to the Pro Bowl for the second time. He was a major contributor as the Ravens went 13-3. For the season, Suggs started nine games at right defensive end in the Ravens base 4-3 and seven games at outside linebacker when the Ravens started game in a base 3-4 defense. Suggs also earned attention for his flashy playing style, "Suggs evolved into one of the league's best pass-rushers whether he is blitzing as a linebacker or rushing from defensive end with one hand on the ground." In Week 7 of the 2008 NFL season, Suggs intercepted a pass from Chad Pennington of the Miami Dolphins and returned it 44 yards for a touchdown, the first pick six of his professional career. Two weeks later, he intercepted Derek Anderson of the Cleveland Browns for a game-sealing touchdown. At season's end, he was named to his third Pro Bowl after producing 68 tackles (53 solo), 2 forced fumbles and 8 sacks to go along with the 2 interceptions, a new career-high 9 pass break-ups and 2 touchdowns. 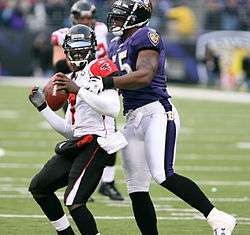 During the 2008–09 NFL playoffs, Suggs recorded sacks in all three of the Ravens' post-season games, including two in the AFC Championship game against Ben Roethlisberger, whom Suggs sacked often over the years. On February 18, 2009, he was once again given the Ravens' franchise tag. On July 15, 2009 the Ravens signed him to a 6-year, $62.5 million contract. His bonus money ($33.1 million) made him the highest paid linebacker in NFL history. In 2010, Suggs compiled 68 tackles (53 solo), 11.5 sacks, 2 forced fumbles and 2 pass deflections. In the play-off win over the Kansas City Chiefs in the wild-card round, he made 4 tackles (all solo) and two sacks. Against the Steelers in the divisional playoff round, he recorded six tackles (5 solo), a career-high three sacks, and a forced fumble that was recovered and returned for a touchdown by fellow DE Cory Redding. After the conclusion of the 2011 season, Suggs was named #11 on the NFL Top 100 list for 2012. During the 2012 offseason, Suggs tore his Achilles tendon allegedly while playing basketball; though Suggs and his agent have claimed that he was hurt while doing conditioning workouts. Owner Steve Bisciotti stated that it was no concern where he hurt it and the Ravens will not try to avoid paying him his contract. Some medical experts believed that Suggs' injury should have forced him to miss the 2012 NFL season, however Suggs claimed he would return by November 2012. On October 20th, 2012, Suggs was removed from the Physically Unable to Perform (PUP) list, allowing him to play October 21 against the Houston Texans. Suggs has been the first player in the NFL to recover so quickly from such serious injury. Suggs' return surprised many, as he finished the game with 4 tackles (3 solo), 1 pass defended, and 1 sack, less than 5 and a half months after having Achilles tendon surgery. Suggs was key in the Ravens win over the Denver Broncos in the divisional round of the playoffs with two sacks on Broncos Quarterback Peyton Manning, after which, the Ravens advanced to New England in a rematch of the previous year's AFC Championship Game where they defeated the Patriots 28-13. The win gave Suggs his first ever AFC Championship and his first appearance in the Super Bowl, being Super Bowl XLVII against the San Francisco 49ers. In that game, the Ravens won 34-31, earning Suggs his first Super Bowl ring. The 2013 season began very well for Suggs compared to the year prior. Within 12 weeks into the season, Suggs had registered 9.0 sacks and one fumble recovery. Overall in 2013, Suggs started all 16 games with 80 tackles, a fumble recovery, and 10 sacks. For his efforts, Suggs was elected to participate in the Pro Bowl (6th overall). On September 19, 2014, Suggs was fined $5,512 by the NFL for unauthorized apparel in which he wore a gladiator helmet during the pregame before the Week 2 matchup against the Pittsburgh Steelers. Suggs recorded his first sack of the season against Panthers quarterback Cam Newton (it was a half-sack). From weeks 6-8, he had one sack per game. In Week 7, the sack he recorded on Falcons quarterback Matt Ryan was for a safety, and he also recovered a fumble. From Weeks 10-17 (other than Baltimore's Week 11 bye), Suggs recorded at least one sack in each game, with the one exception being the Week 16 loss to the Houston Texans (a game in which the Ravens had no sacks whatsoever). In Week 10, Suggs had 1.5 sacks on rookie quarterback Zach Mettenberger. Two weeks later, in a Monday Night Football matchup against the New Orleans Saints, Suggs accounted for a sack against Saints quarterback Drew Brees. With the hit, Suggs became the 31st player in NFL history to register over 100 sacks, and the first member of the Baltimore Ravens to achieve such a milestone. In the Ravens' season finale, Suggs recorded a sack, a defended pass and a fumble recovery, all on Browns first-time-starting quarterback Connor Shaw. The Ravens clinched a Wildcard spot in the playoffs that day. Suggs finished the year with 12 sacks, a pass defended, a fumble recovery and a safety. He and Elvis Dumervil led the league in sacks by a pair with 29 (Dumervil led the Ravens with 17). In the Wildcard round of the playoffs, Suggs intercepted a pass from Ben Roethlisberger in the fourth quarter. The ball bounced off the hands of running back Ben Tate, the intended receiver on the play, and landed between a diving Suggs's legs. The Ravens won this game 30-17 and moved onto the Divisional round against the New England Patriots. During the season opener against the Denver Broncos on September 13, 2015, Suggs suffered an achilles injury and left the game. Hours later, an MRI revealed that his achilles was torn, which prematurely ended his 2015 season. In December 2003, Suggs was charged with Felony Aggravated Assault stemming from a March 2003 incident in Arizona. Reports accused Suggs of assaulting a man with a reinforced rod and attacking another man in the parking lot of Phoenix Municipal Stadium after a basketball tournament. Suggs' brother was accused of hitting a man with a baseball bat in the same altercation. His accuser Jeryme Cook stated that the fight began with words exchanged between Cook and Rico Suggs, the football player’s cousin, but they went their separate ways. Reports stated that Terrell Suggs later showed up courtside of a game that Cook and his friends Anthony Henrie and Casey Cothern were watching. Allegedly, Terrell Suggs held a baseball bat to his shoulder, and was with Rico Suggs, brother Donald Suggs and two other men. Cook stated that after exchanging words with Suggs he and his friends walked away, but the Suggs group kept following them around the tournament grounds and eventually to the parking lot, where Cook said he figured he was going to have to fight Rico Suggs. Cook stated that at one point Terrell Suggs handed his kid brother the baseball bat and said, "If anyone jumps in you swing the bat to kill, not to hurt". A witness stated that Donald Suggs then stuck the bat close to Cook’s face. Cook said he swatted the bat away with his hand, turned to calm Henrie, and then saw Terrell Suggs take a swing that broke his nose and cheekbone. In June 2005, Suggs was acquitted of the charges. Juror Richard Tudor stated, "Charges could have gone either way on it, the case wasn't investigated enough to prove either way. It's supposed to be guilt beyond a reasonable doubt, and they just couldn't prove that”. Suggs had faced a 5 year prison sentence if convicted. In 2009 Suggs's girlfriend Candace Williams filed a complaint against Suggs alleging he threw a soap dispenser at her head, struck her in the chest with his hand and held a bottle of bleach over her and their 1 year old son. No criminal charges were filed against Suggs, and Williams' subsequent lawsuit was dismissed. In September 2012 Suggs was accused of punching and dragging his girlfriend Candace Williams beside his car, while his two children were inside. A temporary protective order was placed against Suggs. No criminal charges were filed. An attorney representing Suggs confirmed that Suggs surrendered his arsenal of firearms to police which included an AK-47 and six other guns. The court order stemmed from a temporary protective order filed by his girlfriend Candace Williams on November 20, 2012. Despite Suggs' rocky relationship with Candace Williams, the two were married on December 14, 2012. The couple have two children together. ↑ Duffy, Mike (August 23, 2007). "NOTEBOOK: Chester Feeling Fine". Baltimore Ravens. Retrieved 25 March 2012. ↑ Walters, Charley (January 12, 2003). "TWINS SET SIGHTS ON PITCHER BALDWIN". Saint Paul Pioneer Press. ↑ Player Bio: Terrell Suggs – ARIZONA STATE OFFICIAL ATHLETIC SITE. Thesundevils.cstv.com. Retrieved on 2011-01-15. ↑ Bell, Jarrett. (2003-04-15) Suggs out to show he has NFL stuff. Usatoday.Com. Retrieved on 2011-01-15. ↑ Lee, Edward. (2010-12-23) Suggs closing in on pair of marks. baltimoresun.com. Retrieved on 2011-01-15. 1 2 "Ravens franchise Suggs at LB; he says he should be DE". ESPN.com. 2009-02-18. Retrieved 2009-12-23. ↑ "Ravens Place Franchise Tag on Suggs". Baltimore Ravens. 2009-02-18. Retrieved 2010-12-23. 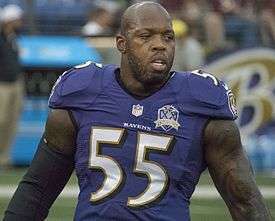 ↑ Terrell Suggs. Rotoworld.com (2009-07-15). Retrieved on 2011-01-15. ↑ Terrell Suggs' agent blasts Brady Quinn for possible season-ending injury. cleveland.com. Retrieved on 2011-01-15. ↑ Rosenthal, Gregg. "Terrell Suggs hurt on basketball court, witnesses say". NFL.com - Around The League. NFL.com. Retrieved 6 June 2012. ↑ Wilson, Aaron. (2014-11-25) Terrell Suggs reaches 100-sack milestone as Ravens pressure Drew Brees. baltimoresun.com. Retrieved on 2014-11-27. ↑ "Baltimore's Terrell Suggs acquitted of assault charges". USA Today. 2005-06-29. ↑ "Ravens LB Raven Terrell Suggs gives up guns after domestic dispute, attorney says - CBS News". CBS News. 2012-12-07. ↑ Dicker, Ron (2012-12-07). "NFL Star Has Guns Taken Away". Huffington Post. ↑ "NFL Star Has Guns Taken Away". Huffington Post. 2012-12-07. 1 2 "Baltimore Ravens Defense Career Register". Pro-Football-Reference.com. Wikimedia Commons has media related to Terrell Suggs.